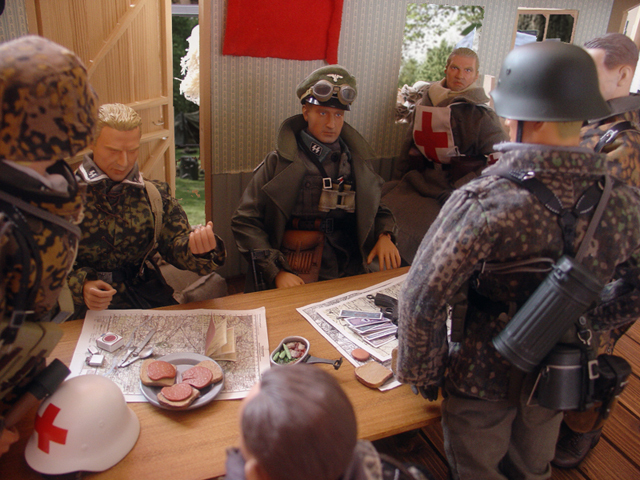 Sixth Army Group :: View topic - Entry #19 "Bildschirmjaeger"
SS-Sturmbannführer Edmund Seitz is resting and discussing some battle-tactics for the next day of bitter fighting against the skilled American paratroopers of the 101st airborne-division. 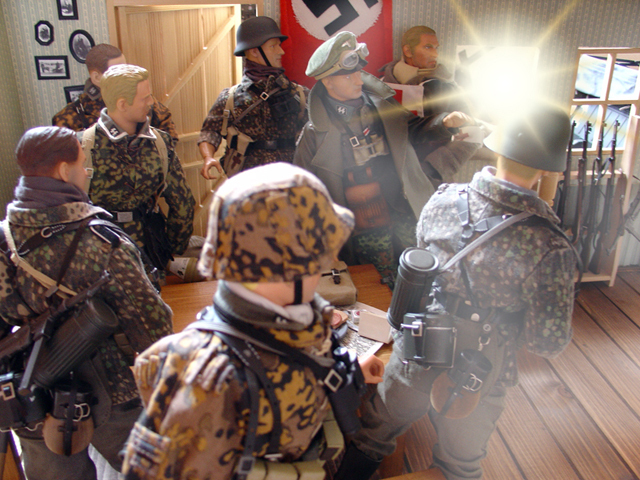 Suddenly an enemy grenade explodes near the H.Q of the Kampfgruppe! All of the men jumped up, as if they were electrocuted. Sturmbannführer Seitz orders Grenadiere Kurt and Lothar to regroup the furniture immediately, in order to make a hiding place: the soldiers can defend themselves better now, they almost can’t see through the smoke left by the grenade. Bernhardt is rushing for the stairs to get to his sniper-spot. The American counter-attack is massive, a huge rain of bullets is fired by the U.S paratroopers, Sturmbannführer Seitz and Genadier Lothar are hit! 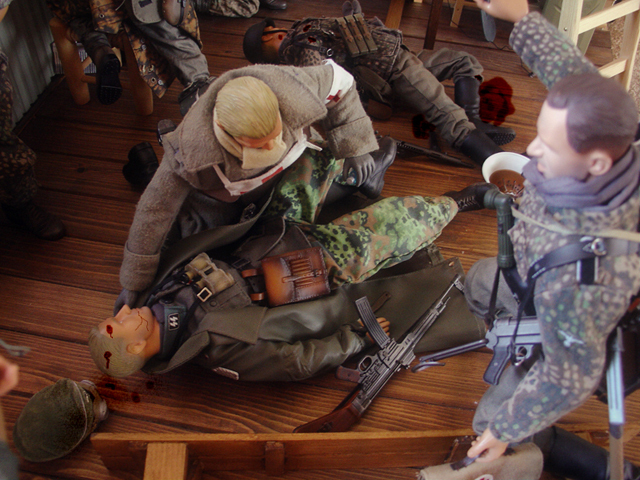 The Sani is trying to take care of them, it’s already too late for Lothar. 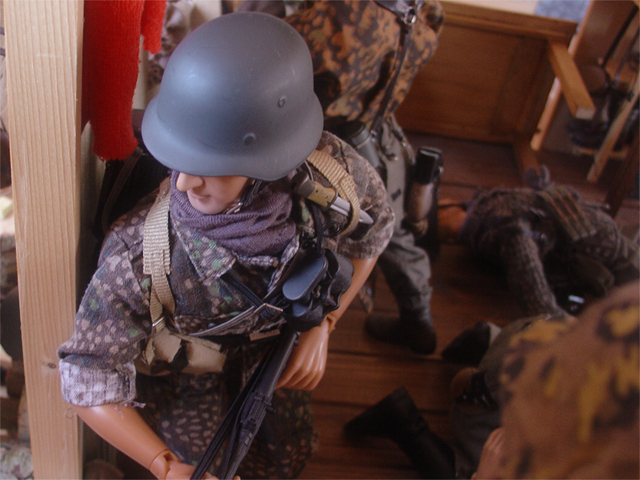 Grenadier Kurt is jumping in to bring the Sani‘s gear but like Lothar, Sturmbannführer Seitz didn’t make it, the Sani couldn’t stop his bleeding. The soldiers have to break their dog-tags. 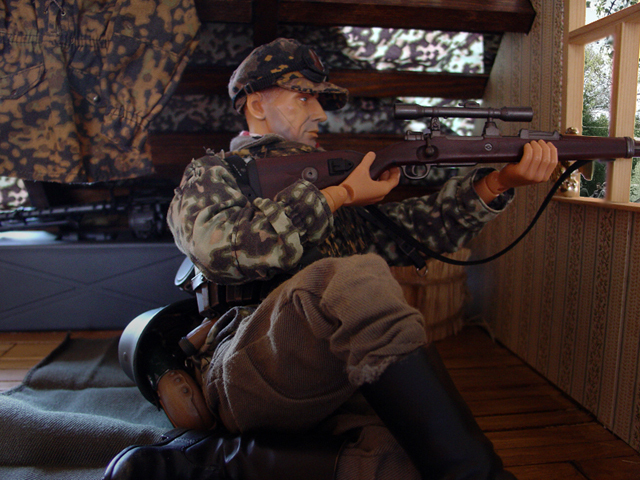 Bernhardt is shooting at the paratroopers like a madman, to put a stop to the counter-attack. I was totally blown away to find out your entry was made by a 16 year old young lady. To have the kohonas to enter this contest shows me you have the 1/6th savy. Your interest is unbelievable. Hell you are already asking me how to build mine crates and I've only met you 3 days ago. Great job and keep em coming. Agree completely with Dr. D! Excellent dio - with good progression of figure posing to tally with the storyline! Very nice! BTW, was this the house you used in one of your dio shoots? I knew it looked familier I really liked the posing and unis on your figs! I to am awe-struck that a 16 year old young lady has done a great story line! Well done :) I look forward to your future works. I like much this one history of WWII. ok. Byye bbye.